Each day seems to bring fresh warnings of the pressures bearing down on the NHS. As resources fail to keep track of demand, the principle of universal healthcare is under threat as never before. Excessive waiting times, the rationing of new drugs, ambulances queuing up outside A&E, staff shortages, the list goes on. What has brought the NHS to the precarious position it now finds itself in? And what might be done to ensure in future that care goes to those who need it, when they need it? This collection of essays by a cross-section of leading commentators explores the background to the present crisis and, more importantly, gets to grips with some of the ideas that need to be considered for reform. Contributors with a wide variety of political perspectives range from a former Health Secretary to working NHS doctors to academics and journalists. Each makes a unique input into the debate about how we must evolve our thinking if universal healthcare is to function effectively in the years ahead. The conversation is wide-ranging and often provocative. For some, reforms need only be made within the NHS in its current form. But, for others, guaranteeing free and equal access to services for the entire population requires looking beyond the existing structures of care. Most agree, however, that any serious effort to ease the burden on health services must start with the individual – long before they come to call on the NHS. 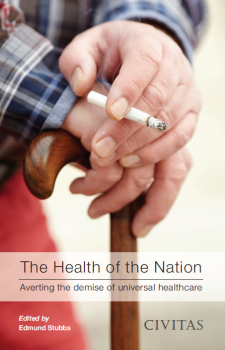 Averting the demise of universal healthcare does not just end with the health of the nation: it begins with it too. The Health of the Nation features contributions from eleven authors from the across the political spectrum. ‘For too long the Public Health service has been confused with the public’s health. Whilst the former is an important aspect of our services, it is the latter that really matters. The full list of contributors: John Ashton (President of the Faculty of PublicHealth), Melanie Reid (writer and columnist at The Times), Mark Porter (leader of the British Medical Association), Sally Al-Zaidy (Head of health policy at the BMA), Steve Melton (Chief Executive of Circle Health), Phil Hammond (NHS doctor and broadcaster), Paul Corrigan (worked in the NHS and is now a management consultant and an executive coach), Stephen Dorrell (Former Secretary of State for Health), Richard Murray (Director of Policy), David J. Hunter (Professor of Health Policy and Management), Richard B. Saltman (Professor of Health Policy and Management at the Emory University School of Public Health), Marco Viceconti (Chair of Biomechanics at the Department of Mechanical Engineering and Professor Associate at the Department of Oncology and Metabolism at the University of Sheffield). Edmund Stubbs is Healthcare Researcher at Civitas. Edmund studied Biomedical Science at the University of Sheffield and health policy at the London School of Economics and Political Science. Edmund also worked as a healthcare assistant for four years at Addenbrooke’s Hospital, Cambridge. His recent publications include ‘Supplying the Demand for Nurses’ and ‘The Road to Healthcare Devolution’.